Legends in Concert, a Tribute to the Stars, has returned to Australia to perform at The Palms at Crown Melbourne after a long 17 year absence, much to the delight of eager fans. This international musical showcase pays tribute to some of the world's greatest musical artists, bringing together a gathering of highly talented vocalists who impersonate artists you know and love. The Palms' auditorium is an interesting set up, with a raised stage in front of the audience floor, which in this instance, houses rows of seats for the Legends in Concert show. You will also find cabaret-style tables in tiered intimate booths and balcony tables to the rear of the theatre, much like you would imagine in a Las Vegas setting. The performance is an all-singing, all-dancing spectacle, which pays tribute to musical artists from yesteryear to current day. As you would imagine from any show arriving in from 'Viva' Las Vegas, you can expect tiny glitzy costumes worn by oh-so lean and beautiful backing dancers. That said, Legends in Concert isn't all about backing dancers, nor the very talented live band, although both contribute to the success of the show. 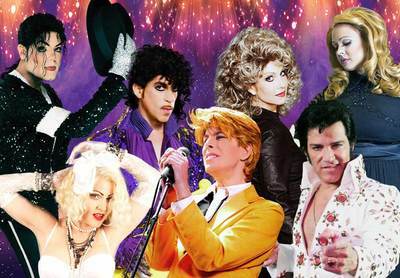 The main stars are, of course, the talented impersonators of; Prince, Elvis Presley, David Bowie, Michael Jackson, Adele, Olivia Newton-John and Madonna. Rather than having one star of the show, there are many, as each performer impersonates their chosen musical artist down to a tee. Legends in Concert takes you back in time, on a musical journey through pop and rock. You will be singing along and toe-tapping in no time, right from the onset in fact, when Prince hits the stage in his purple number. There are many, many favourites throughout Legends in Concert, both individual songs and the stars themselves, but I'd have to say Damian Brantley, who performs as Michael Jackson really stood out for me. 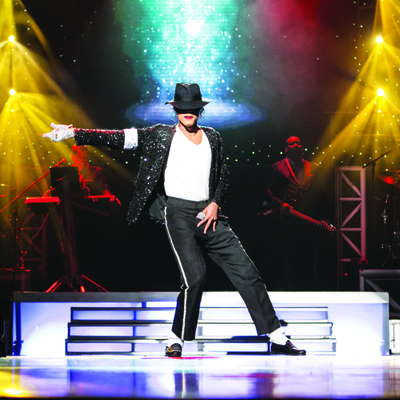 As a long time fan of the late and great MJ, Damian plays his 'alter ego' persona perfectly, he moves like Jackson, talks like Jackson and works the stage exactly as Michael Jackson used to, right down to his moon walk and beat box. They say the best is saved for last, and although Michael Jackson stole the show, Elvis Presley, played by Kevin Mills, nailed his performance. He's an absolute star, who wowed the audience no end with his strut around The Palms stage. Not forgetting the other stars of the show, who are all incredible talented in their own way. The singer who performs 'Living Legend' Adele, is an incredible songstress who can really belt out the singer's well-known pop ballads. Go and see Legends in Concert if you are a fan of pop and rock. You'll be taken back on a fun musical journey, and be wowed no end by the exceptional musical talent that other people can replicate in such a similar fashion as their alter ego.